(leading to ExpertRating ASP. 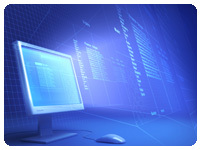 NET Programming Skills Certification). Learn how to use Microsoft's visual Web developer to create exciting, interactive, and polished Web sites with ASP. NET. Using ASP. Net's powerful membership features, you'll develop a true community-based Web site that allows users to register, log in, create and update profiles, and post messages to a forum. About the ExpertRating Online ASP.NET Course instructor : Jeffrey A. Kent is an Associate Professor of Computer Science, teaching both traditional and online classes. He has taught a number of computer programming languages, including C, C++, Java, Visual Basic, and Assembly. He is the published author of several computer-programming books, including Visual Basic 2005 Demystified and C++ Demystified. He's also an attorney, and has combined both careers by writing applications for law firms. ASP. 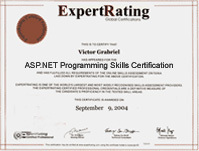 NET Skills Course requirements: For taking this instructor led ExpertRating Online ASP.NET Course you need Microsoft .NET Framework version 2.0 or better and Visual Web Developer 2005 Express Edition, both available from http://www.asp.net (software must be installed and fully operational before the course begins); Windows 2000 (with Service Pack 4), Windows XP (with service Pack 2), or Windows Vista; 192 MB RAM or more, 500 Mega Bytes Free Disk Space (full installation requires 1.3 GByte free disk space); Internet access; e-mail; and the and the Microsoft Internet Explorer or Mozilla Firefox Web browser. Note: This course is not suitable for Macintosh users. "Another excellent web development course! The courses I have taken are so informative and for me it is a great way to learn. Jeff is an awesome instructor. I had no problem following the lessons and doing the course work. Everything worked out just as the lessons said it would. This course was a challenge and I would recommend a basic web course before taking ASP. NET. It was well worth the time and effort and I definitely want to continue taking more classes. Thank you!" "Good course and it was very informative. Thank you for providing the links to related information that is available on the web. Very good writing style. It was easy to understand." "I enjoyed this class and learned a basic knowledge of asp. net. I would recommend this course to anyone looking to gain an understanding of asp. net. The instructor was very helpful and informative." "I really enjoyed this course. The instructor's writing style was very clear and the lessons were written very well. He provided examples throughout and made it simple to learn!" "I really liked the informal, real-world instructional style. Jeff made a concerted effort to explain and describe things in a way that was accessible to non-programmers. I would definitely be interested in taking another of his courses." "I think this is an excellent mode of learning. It takes a special sort of instructor to be able to pull this together and make everyone feel that they are engaged in the class. I wish I had Jeff around all the time to translate everything Microsoft says!" "This was the best ed2go class I've taken to date. I feel as if I learned a lot of realistically useful information, that I can now expand upon my online studies through books and dialogue with others and actually become PROFICIENT in ASP. NET. The teacher's writing style was engaging, the examples were well-written and easy to understand, and the assignments were accessible and HELPFUL. Thank you for a wonderful class!" ExpertRating is one of the world's only ISO 9001:2015 Certified companies (from TUV America) offering an Online ASP.NET Course (leading to ExpertRating ASP.NET Skills Certification). When you choose the ExpertRating Online ASP.NET Course you can be sure that you are buying a premium International certification that is recognized by hundreds of employers and Government bodies in the US and other countries. With ExpertRating you get certified quickly online and you are equipped with a store house of information through the in-depth ExpertRating Online ASP.NET Courseware which has been developed by experienced Programming Experts. The ExpertRating ASP .NET Programming Skills Certification is by far the best value for money instructor led ASP .NET Program at $129.99. How much does the ASP .NET Programming Skills Certification cost and what does it include? You can buy this ExpertRating Online ASP.NET Course leading to ASP .NET Programming Skills certification at a special offer price of only $129.99 which includes the in-depth ExpertRating Online ASP.NET Courseware and exam fee. This is the best value for money ASP .NET Programming Program available till date. You get the following services within the USD $129.99 fee. In-depth ExpertRating Online ASP.NET Courseware including scenarios and case studies. World wide airmail delivery of the hard copy ASP .NET Programming Skills Certificate. The ASP .NET Programming Skills Certificate can be used to prove your certified status and does not mention the words "online". The process of getting yourself certified is very simple. All you have to do is buy the ExpertRating Online ASP.NET Course for $129.99. Log in to the instructor led course using your password. Go through the ExpertRating Online ASP.NET Courseware (which would take you 6 weeks) and complete the final ASP .NET Programming Skills Certification exam at your convenience. You can complete the exam within 2 months of buying the ASP .NET Programming Skills Certification. The result of the exam appears as soon as it is completed, and your ASP .NET Programming Skills Certificate is mailed immediately. Chapter assignments to help you practically use the ASP .NET Programming Skills that you will learn during the ASP .NET Programming Course. The final exam is fully based upon the ExpertRating Online ASP.NET Courseware that is provided along with the ASP .NET Programming Skills Certification. If you have gone through the courseware properly you should not have a problem clearing the exam. The exam consists of multiple choice questions from all chapters of the ExpertRating Online ASP.NET Courseware. ASP. NET pages are developed with advanced programming languages such as Visual Basic .NET and C#. ASP. NET is a boon for the programmers that helps them to develop forceful web applications, web sites and web services. This web application is an easy to use and simple application which has features like tool support, reliability, scalability and security. ASP. NET makes full use of the Common Language Runtime, type safety, inheritance and security. ASP. NET is a useful tool for both web developers as well as administrators. ASP. NET is a new programming model that provides more scalable and stable applications which promise greater protection. The ExpertRating ASP. NET Certification is an excellent way for you to prove your professional prowess to employers while giving a boost to your resume. In this first lesson, you'll download and install free software that will help you start creating your own Web sites using ASP. NET. What exactly is ASP. NET? You'll find that out here, too. You'll also see just what makes a Web site tick and you’ll learn how to work with a Web browser. You'll discover how the better sites don't just send Web pages to a browser, but rather they create and customize pages right on the spot to produce an exciting user experience. You'll start creating Web pages that include buttons and text boxes, which visitors can use to submit information. You'll see how you can write ASP. NET programs that read this information and use it to create a new Web page in response. The sequence of events that does this is called a postback, and it's a crucial and exciting element of developing interactive Web sites. In this lesson, you'll delve further into creating interactive Web sites, picking up a few programming tricks that will help make your life easier. One such technique is the use of object-oriented programming. Many people have heard of this type of programming, and you'll discover how easy it really is to master. You'll also add another control to your Web site, a list box. Then you'll see how you can write code that will run on the Web server in response to the user interacting with your Web page by pushing buttons. An exciting way to fancy up a Web site is to customize its overall look. You can choose a site's colors, fonts, borders, and general look using a technology called styles. You'll combine everything you've learned so far to make some really attractive pages that incorporate various styles and controls. While creating Web sites with ASP. NET, you're free to make use of an entire programming language, and you're free to pick from two exciting ones: VB.NET and C# (pronounced C Sharp). This course will focus on VB.NET, and in this lesson, you'll see how you can keep track of small pieces of information using variables. Then, to try out some of the techniques this lesson will go over, you'll create a really cool calendar—and see just how incredibly easy it is to do. But then the excitement really begins as you find out how to store large amounts of data in a database. Professional Web sites make use of databases to store information on millions of customers, and with your newfound knowledge of databases, you'll be able to build Web sites that do this, too. In order to make use of a database, your Web server needs to connect to it. Then the data can start flowing, whether it consists of only a small amount of data or information on millions of customers. You'll see how to connect to a database. Then you'll learn two ways to display this data on a Web page in the browser. You'll find out how to display data in a grid fashion using a control called a Grid View, and how to display it in more of a tabular fashion using a Details View control. These controls are so easy to use that you'll have a fancy data-processing Web site up in no time. In this lesson, you'll start getting into the nuts and bolts of databases. You'll see how data is stored using relationships, whereby a customer in the database might, for example, be related to several orders that he or she made. You'll see that databases are all about relationships, and as such are called relational. As you explore relational data techniques, you'll make use of yet another control for displaying data called the Form View control. This control is incredibly powerful and can display data exactly the way you want it to. Lesson 8 will continue exploring relational data, and you'll discover how to use a simple, special language called SQL to read data from a database. These days, most database systems use SQL, and this lesson will make sure you get the skills you need to work with it. This lesson will also discuss another control called a Repeater that lets you display several pieces of data in exactly the format you choose. In this lesson, you'll step away from the world of databases and see how you can make all the pages in your Web site look similar using Master Pages. With the help of Master Pages, you can provide a common set of controls to all your pages, much like the navigation links you see across the top of many Web sites. You'll discover how you can set these controls up once and make them appear on all the pages of your Web site. You'll get to pull together everything you've learned and start building your own community Web site, much like the popular ones you often hear about. You'll build a site that includes login and registration boxes so people can register with your site and then log in. You'll find out what pages are necessary and what data you need to include. You'll create a Master Page that contains a navigation bar that will be accessible throughout your site. And you'll set up the styles to give a common set of colors and fonts throughout your site. In this lesson, you'll finish building your community Web site. You'll put together pages that let users create profiles. Your users will be able to type in the text for their profiles and provide images to go with them. You'll also create a page that lets visitors view the profiles of other users. You'll find out how to present your users with a list of everybody in the community. And you'll even create a forum where people can exchange messages. It's hard to believe you could accomplish all this in just two lessons, but with ASP. NET, it's incredibly easy! To end this course, lesson 12 will cover the important topic of Web security. In this lesson you'll learn how to protect your Web sites from hackers and prevent some common types of attacks. You'll also see how to make smooth transitions between the different pages of your sites to provide a nice user experience. Finally, this lesson will go through some advanced topics you can explore on your own if you'd like to learn even more about the world of ASP. NET programming. You'll get armed with the knowledge you need to build some really great, sophisticated, interactive Web sites.